\r\nAnne B. Kelly is an artist, designer and the founder of www.femalepersuasion.net, an online network and virtual gallery for provocative and political female artists. Femalepersuasion.net has been recognized worldwide in various exhibitions and in publications such as PRINT Magazine, JANE and the LA Times. A graduate of UCLA with a BA in design, she is also currently an Entertainment Advertising Art Director at Cold Open. Graphic design is often the slick and commercial sister to the arts, and few designers are able to create a recognizable name and breakout style for themselves. Even more rare are the standout female names in the field. Try googling "famous female graphic designers" and you will find articles such as "Women Will Never Be Rock Star Designers" in which Milton Glaser offers his particular sobering opinion. Happily, Phoenix-based designer Tiphanie Brooke shatters that myth with a fresh style that proves that her brand of graphics is not only feminine but also has soul. 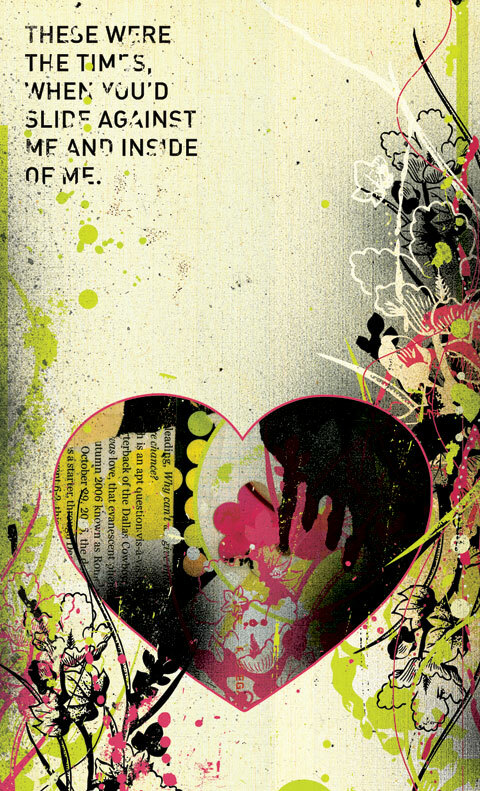 From the Hearts Collection, 2010 ©Tiphanie Brooke. Courtesy of the artist. 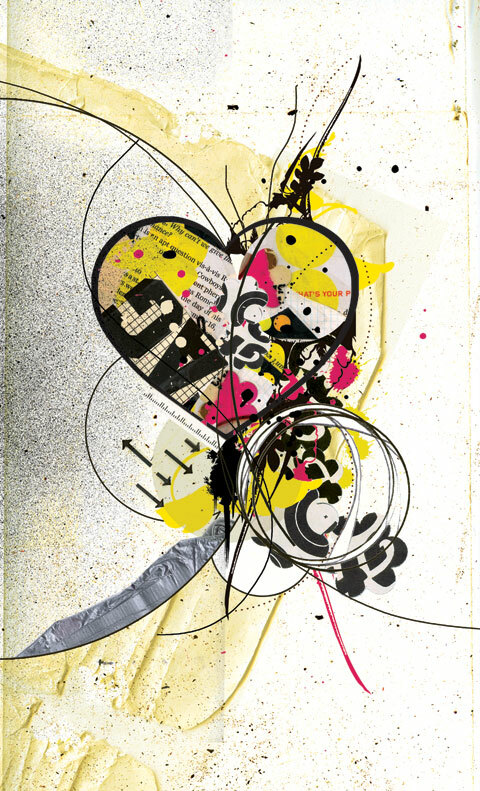 From the Hearts Collection, 2009 ©Tiphanie Brooke. Courtesy of the artist. When asked as a teenager, "Why are you so anti, girl?" she says the name "clung like crazy glue" and thus her cult brand name "Antigirl" was born. 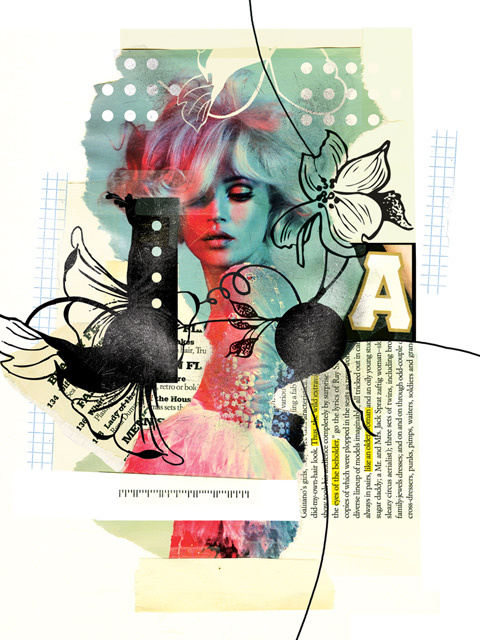 Her contrary attitude is what adds an angular punk bite to the warmth of her mainly sweet themes: iconic hearts, florals, supermodels strategically cropped from magazines. If it sounds girly... it is. But maybe in the same way the Runaways were a girly introduction to rock music. She's adopted the phrase "never not working" and with creativity drawn from shooting guns as stress relief (Glock-19 and HK .357 SIG), Scrabble and card games, Kentucky bourbon "straight up," and "angry bald men," she has an eccentric wild streak that naturally finds its way into her pieces. She admits, "I make things like the Heart and Women series because it is one of the few things [I can do] that isn't self destructive... it's like I have to do it." From the Women Collection, 2007 ©Tiphanie Brooke. Courtesy of the artist. At the start of her design career, Brooke admits wanting to just "make things look pretty." However, as her style has evolved she has found that pictures used for commercial purposes can be "retouched and redone" to become something beautiful on their own, clean of any meaning. "We're literally bombarded with images every day," she explains, "and most of the images are trying to sell us something or change our minds. I like to take these messages and rearrange them, somehow making them more than they were originally intended." Garfield Women, 2010 ©Tiphanie Brooke. Courtesy of the artist. 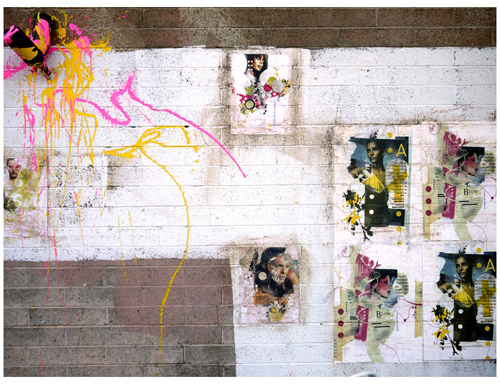 Ex Holgsa, Concepts for murals in Phoenix, 2010 ©Tiphanie Brooke. Courtesy of the artist. 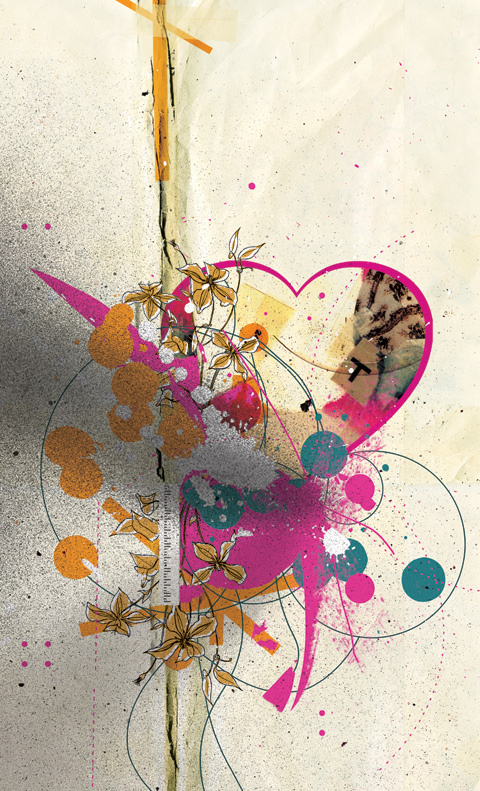 She is masterful when it comes to mixed media, working in papers, glues, inks, paints, and digital alterations. Her creative process "developed out of desperation," she says. "The graphics programs wouldn't do what I wanted when I first opened Photoshop at [age] 14." Now when asked what portion is done by hand and what is done by computer she can barely answer. In fact, she wavers between calling herself a graphic designer and calling herself a "graphic artist who does fine art." Perhaps by breaking the rules the titles no longer matter.